Interscalene brachial plexus block is a common regional anesthesia method for upper extremity surgery. A rare complication of this procedure is dyspnea secondary to phrenic nerve palsy and hemidiaphragm paralysis. In our case, this rare complication diagnosed using ultrasound led to the diagnosis of a previously asymptomatic pulmonary embolism. The use of ultrasonography was key in the diagnosis of the iatrogenic nerve palsy and was part of a multiple-modality diagnostic workup for her hypoxemia. The use of brachial plexus blocks has been widely accepted as a safe and reliable method of anesthesia for upper extremity surgical procedures. Despite its relative safety, known complications can include seizure, pneumothorax, high cervical blocks, peripheral neuropathies, and cardiovascular collapse . Transient phrenic nerve palsy resulting in hemidiaphragm paralysis is a common side effect of the procedure that rarely produces symptoms . There have only been a small number of case reports on symptomatic dyspnea related to hemidiaphragm paralysis during interscalene blocks. While all these cases involved patients with symptomatic respiratory distress, clinical hypoxemia was reported only once . The acute hypoxemic respiratory failure observed in this case led to the further evaluation and diagnosis of an underlying, sub-acute pulmonary embolism. A 63-year-old female with past medical history of hypertension, obesity, and obstructive sleep apnea, was transferred from an outpatient surgery center in acute respiratory distress after the placement of an interscalene brachial plexus block prior to right shoulder surgery. A previous traumatic injury had left her with chronic shoulder pain and paresthesias. These symptoms had led to a decrease in her normal level of activity in the time leading up to her surgery. Preoperatively an interscalene brachial plexus block had been placed with the position confirmed by nerve stimulation testing. Adequate regional anesthesia was accomplished and no apparent complications were initially observed. When the patient was moved to the operating room, she experienced acute dyspnea and her oxygen saturation (SpO2) fell to 85% on room air. This improved with supplemental oxygen, but her dyspnea continued and breath sounds were noted as absent on the right side. Due to the concern for iatrogenic pneumothorax, the patient was urgently transferred to the emergency department (ED) for further evaluation. In the ED, she continued to require supplemental oxygen, while the rest of her vital signs included a heart rate of 77, respiratory rate of 20, and a blood pressure of 187/98. On examination, breath sounds decreased bilaterally, right greater than the left. Chest X-ray demonstrated a mildly elevated right hemidiaphragm with mild bibasilar atelectatic opacities (Fig. 1). No radiographic evidence of pneumothorax was appreciated. The patient’s EKG was unchanged from previous, with no findings suggestive of ischemia. Initial labs, including a CBC, basic metabolic panel, and cardiac markers were within the normal limits. The initial differential diagnosis included the possibility of pulmonary embolism, occult pneumothorax, hemidiaphragm paralysis secondary to the interscalene block, and acute coronary syndrome. While awaiting CT angiography to assess for the possibility of pulmonary embolism, bedside ultrasound was performed and revealed good pleural sliding without evidence of pneumothorax. Ultrasound evaluation of the right diaphragm showed no movement with inspiration, including forcible inspiration and expiration by the patient (Fig. 2). This finding supported the diagnosis of phrenic nerve palsy secondary to the interscalene block. At this point, the patient started to improve clinically. Her dyspnea had decreased and she no longer needed supplemental oxygen. Given the ultrasound diagnosis of hemidiaphragm paralysis and the patient’s clinical improvement, as the short acting component of the nerve block was wearing off, consideration was given to canceling the CT angiography. However, it was felt that the patient’s initial hypoxemia was difficult to attribute to an isolated hemidiaphragm paralysis in the absence of significant lobar atelectasis. With the persistent concern for coexistent pulmonary pathology, a CT angiography was obtained. A small, sub-acute, sub-segmental pulmonary embolus was found in the upper posterior right lung. Heparin was started in the ED, and the patient was admitted for observation and conversion to oral anticoagulation therapy. 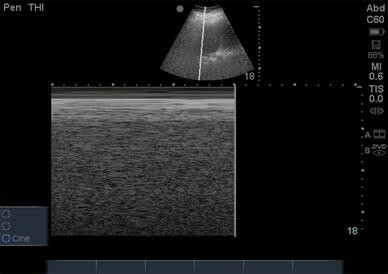 Ultrasound can be utilized in the diagnosis of several types of pulmonary pathology, including the diagnosis of diaphragmatic paralysis [4, 5]. The hemidiaphragm in question is viewed either in the anterior sagittal or lateral coronal plane. The diaphragm can be visualized as moving with inspiration and expiration. This can be viewed in B-Mode imaging during real time or displayed with the use of M-Mode. Figure 3 demonstrates a subject with and without diaphragmatic movement on M-Mode. While an elevated hemidiaphragm on chest radiography can be seen in the presence of pulmonary embolism, it must also raise the possibility of phrenic nerve palsy . The incidence of transient hemidiaphragm paralysis secondary to phrenic nerve palsy during the regional interscalene block has been well documented in previous studies. With the phrenic nerve running along the anterior scalene, local diffusion of the anesthetic from the intended injection site is difficult to avoid [7, 8]. Some studies have quoted the occurrence of phrenic nerve palsy and hemidiaphragm paralysis to be as high as 100% . Despite the high incidence of hemidiaphragm paralysis, only a handful of case reports have ever described patients with symptomatic dyspnea and only one has described clinically significant hypoxemia [3, 7, 9, 10]. In our patient, a number of factors likely contributed to her respiratory distress. With limited lung compliance secondary to obesity and an unknown underlying pulmonary embolism, her functional reserve was clearly limited at baseline. The combination of these factors likely decreased her ability to compensate for the additional stress or hemidiaphragm paralysis. The diagnosis of phrenic nerve palsy would have been missed in this patient if an ultrasound exam was not performed. The CT angiography study that found the pulmonary embolism would not have been able to diagnose the phrenic nerve palsy and paralysis of the hemidiaphragm. The elevated hemidiaphragm may have been attributed to the pulmonary embolism if not for the ultrasound examination. This case report highlights the use of multiple imaging modalities to diagnose a complex presentation of dyspnea and hypoxia that would likely not have been diagnosed by any single method. The utilization of ultrasound provided key information in diagnosing the multi-factorial causes for the patient’s hypoxia and evaluating a common complication of perioperative neuronal blockade.